Three years ago, we created Nearby Notifications as a way for Android users to discover apps and content based on what is nearby. Our goal was to bring relevant and engaging content to users - to provide useful information proactively. Developers have leveraged this technology to let users know about free wifi nearby, provide guides while in a museum, and list transit schedules at bus stops. We've learned a lot building and launching Nearby Notifications. 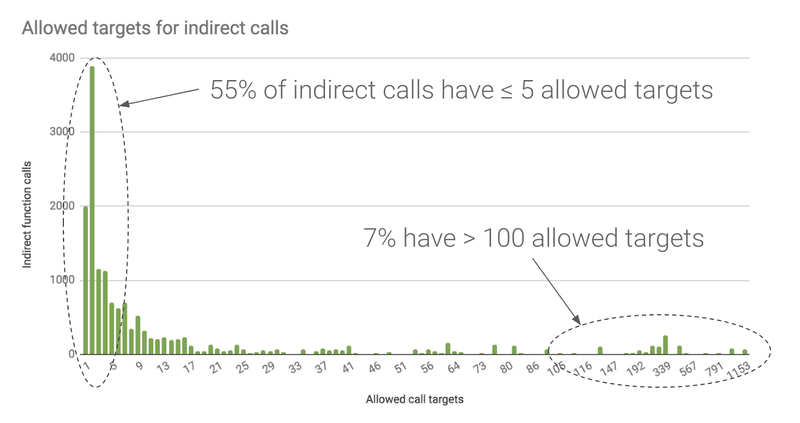 However, earlier this year, we noticed a significant increase in locally irrelevant and spammy notifications that were leading to a poor user experience. While filtering and tuning can help, in the end, we have a very high bar for the quality of content that we deliver to users, especially content that is delivered through notifications. Ultimately, we have determined these notifications did not meet that bar. As a result, we have decided to discontinue support for Nearby Notifications. We will stop serving Nearby Notifications on December 6th, 2018. Having a great idea for an app or game is just the beginning. At Google Play, it's our goal to provide you with the tools and skills to build successful mobile app and games businesses. 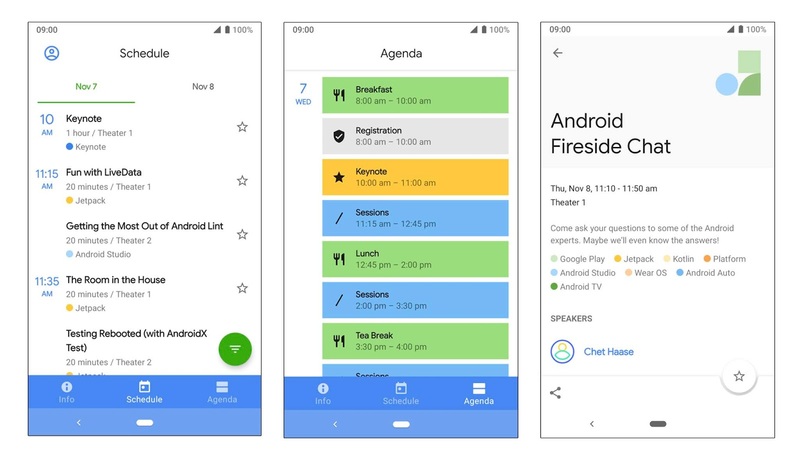 Training continues to be among the top requested features from Android developers, and we've heard your feedback. That's why we're launching a brand new, free e-learning platform to help you realize the full potential of your business on Google Play. 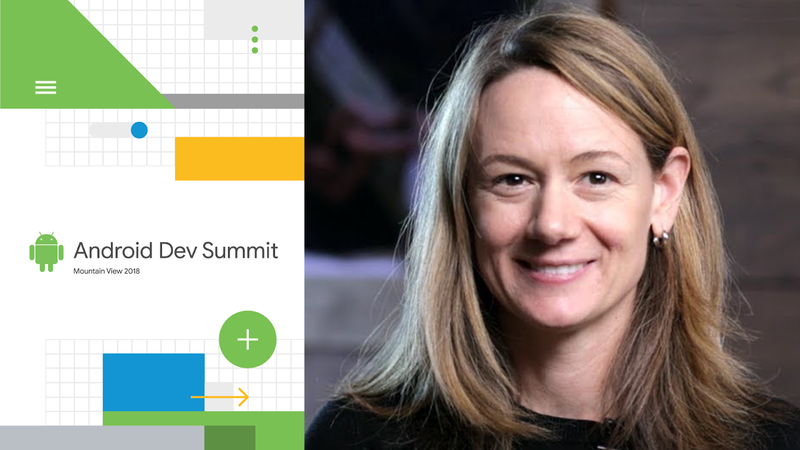 Whether you're looking to grow your audience, understand performance metrics, or increase revenue, Play Academy is here to help you understand the best practices and Play Console features to succeed on Google Play. We built Play Academy to fit into your busy schedule. Learn from your home or office computer, or take courses on-the-go with your mobile device. Choose from 10 collections of bite-sized courses organized around features and best practices, including; Test your app before release, Evaluate your app's technical performance, and Monetize your app. It's easy to get started with free e-learning content from Google Play. Head over to g.co/play/academy to sign up and start your developer journey. Also, make sure you keep an eye on upcoming Play Academy news - we'll regularly update our courses to keep pace with the newest features and programs so that you can stay up-to-date with the latest insights you'll need to grow your app or game business. The Android App Bundle is Android's new publishing format, with which you can more easily deliver a great experience in a smaller app size. Smaller apps have higher conversion rates and our user research shows that app size is a leading motivator in driving uninstalls. 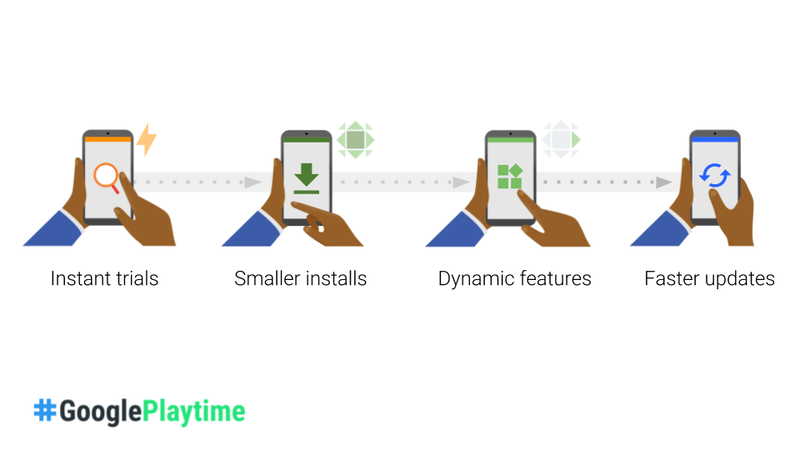 With the Android App Bundle's modularization, you can also deliver features on demand, instead of at install time, further reducing the size of your app. 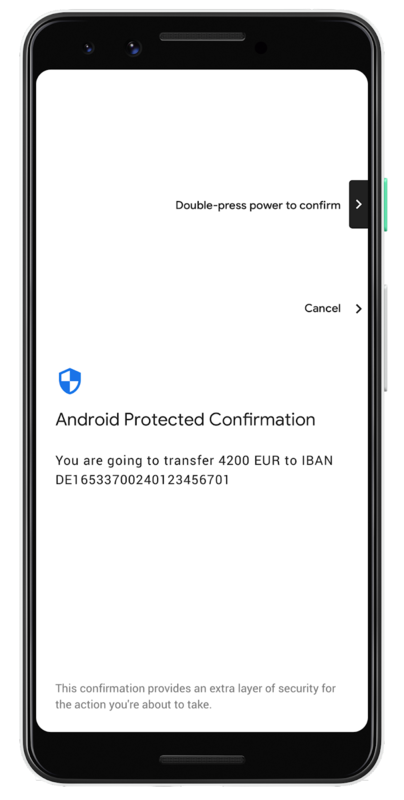 We've been listening to your feedback to make it easier to build instant apps, and we recently increased the size limit to 10MB to enable TRY NOW on the Play Store and removed the URL requirement. For game developers, we've partnered with Unity on a Google Play Instant plug-in and have built instant directly into the new Cocos Creator. Now, you don't have to maintain separate code. With the Android Studio 3.3 beta release, a developer can publish a single app bundle and classify it or a particular module to be instant enabled. The unified app bundle is the future of instant app experiences and we hope you will try it out. 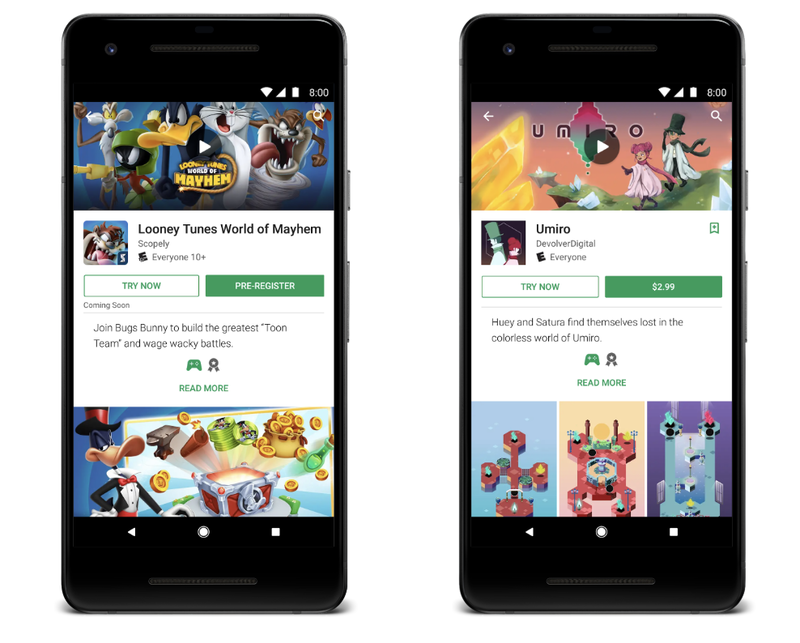 Google Play Instant is now available for premium titles and pre-registration campaigns, so people can try your game before it launches and generate additional buzz. 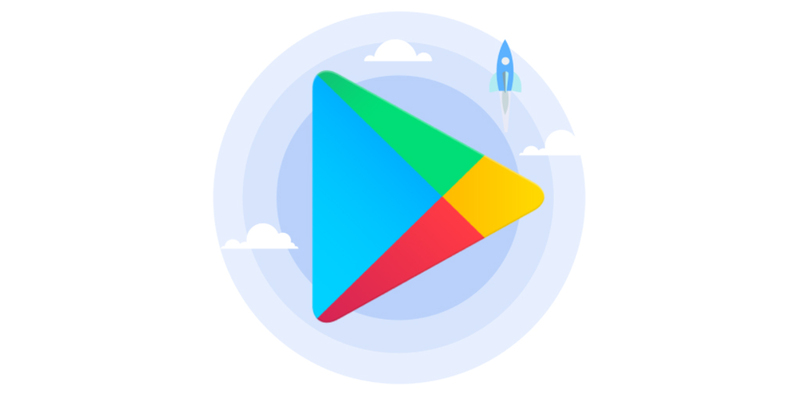 New apps and games join Google Play Instant every day, and we're excited to welcome Umiro, by Devolver Digital, and Looney Tunes World of Mayhem, by Scopely, as some of the first to take advantage of these new features. The Play Console offers two tools to help you monitor performance and improve the quality of your apps. 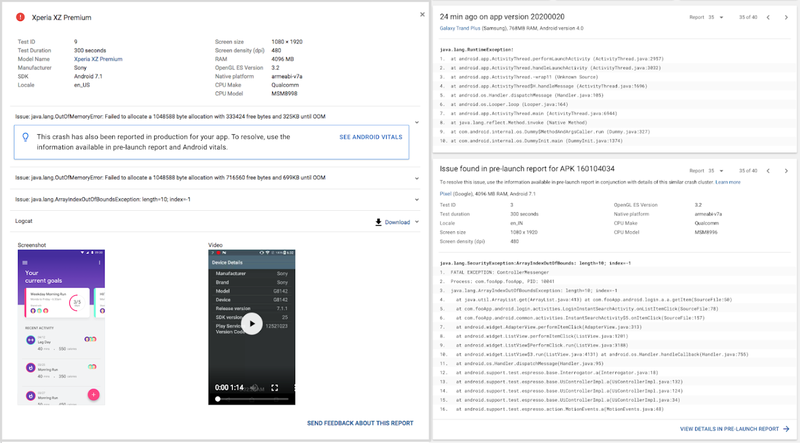 The pre-launch report runs your apps on real devices situated in the Firebase Test Lab and generates useful metadata to help you identify and fix issues before pushing your apps to production. 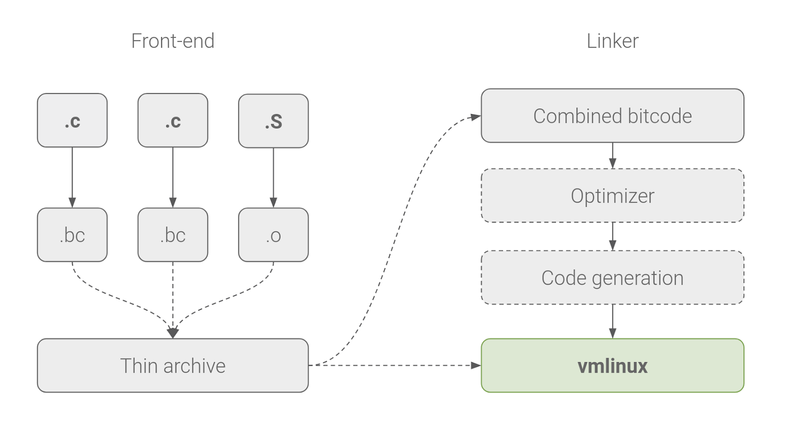 Android vitals helps you track the performance and quality of your app on users' devices in the real world. Now, we're linking them together to provide more actionable insights. Whenever a real-world crash in Android vitals is also seen during a pre-launch report execution, you'll get all the extra metadata from the pre-launch report available to you in the Android vitals dashboard so you can debug more effectively. This is also linked in both directions, so that if a crash occurs in pre-launch reports that is already happening in the real world, you'll be able to see the current impact in Android vitals which will help you better prioritize the issues highlighted by pre-launch reports. We've made several updates to make it easier to manage your app and business with Play. Tools for retaining subscribers: at I/O we introduced the cancellation survey, where you can get insights into why your subscribers are canceling. Now we're testing the ability for users to temporarily pause their subscriptions instead of outright canceling, and giving you the ability to deliver promotions to win back canceled subscribers. More powerful metrics: we've added new tools in the Play Console to help you evaluate your core metrics. Additions include cumulative data, 30-day rolling average metrics, and roll-ups for different time periods to better match the cadence of your business. You can also download any configured reports as a CSV file. 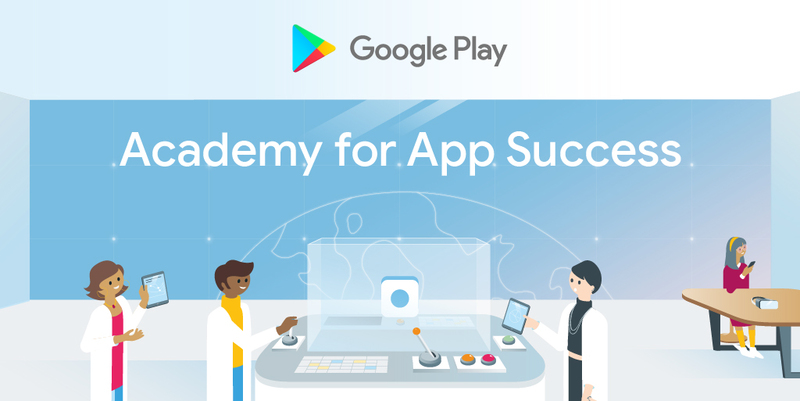 We're equally excited to launch the Academy for App Success with new interactive courses to help developers get the most out of the Play Console, understand Play policies, and utilize best practices to improve quality and increase business performance. This free new program allows you to track your learning progress with quizzes and achievements to demonstrate your expertise. Available in English today, new content and translated courses will be added soon. 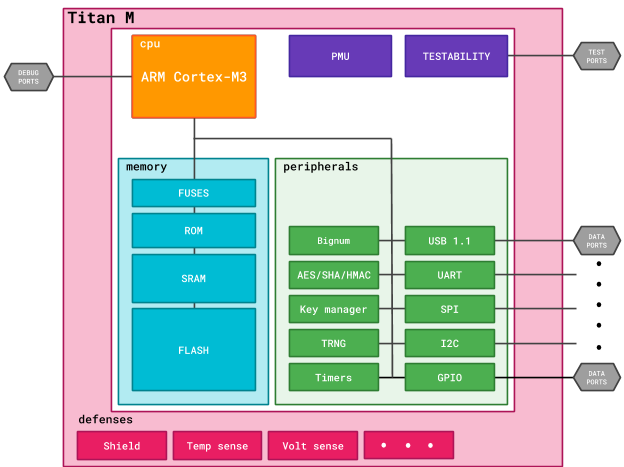 This is the third in a series of blog posts in which outline strategies and guidance in Android with regard to power. Over the years, executing background tasks on Android has evolved. To write modern apps, it's important to learn how to run your background tasks in modern fashion. When is an app in the background? The app has a visible activity, whether the activity is started or paused. The app has a foreground service. Running tasks in the background consumes a device's limited resources, like RAM and battery. This might result in a bad user experience. For example, background tasks may degrade the battery life of the device or the user may experience poor device performance at times such as watching a video, playing a game, using the camera. Doze and App Standby, which restricts app behavior when the screen is off, and the device is idle and not charging. Background Location restrictions, limits how frequently background apps can retrieve the user's current location. Background Service Limits, that restrict background services from being run and consuming CPU/network in a hidden/non-visible way. Most recently, App Standby Buckets that can limit the device resources available to apps that aren't used by users, and App Restrictions where the system will prompt the user to restrict the app's access to system resources in the background if the app exhibits bad behaviors, and several Battery Saver improvements. WorkManager is the recommended solution for background execution, taking into account all OS background execution limits. 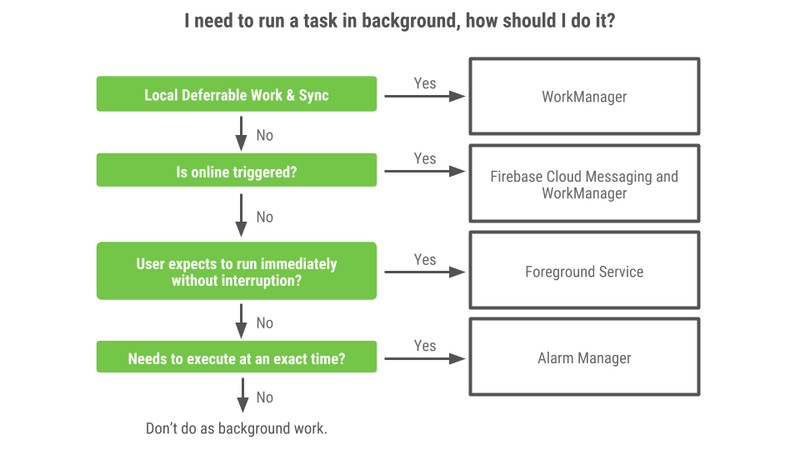 If you need to guarantee that a task will run even if it is deferred, you should use WorkManager. This API allows you to schedule jobs (one-off or repeating) and chain and combine jobs. You can also apply execution constraints to them such as triggering when the device is idle or charging, or executing when a content provider changes. First: compress the file. On this step you may add the constraint that the device should be charging. Second: upload it to the server. For this request you should add a network connectivity constraint so that the work only gets triggered when you have a valid connection. After enqueuing both tasks, WorkManager will take care of executing them when your app has access to the resources you need. Another nice feature of WorkManager is that it respects power-management features, so that if a job is scheduled to run at a defined time and the device is in Doze at that time, WorkManager will try to run the task during a maintenance window if the constraints are met or after Doze is lifted. 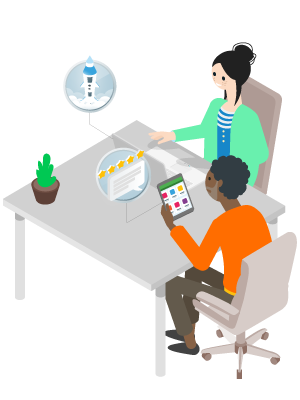 If a long-running task is to be scheduled in response to an external event like syncing for new online content, use Firebase Cloud Messaging to notify your app and then create a work request with WorkManager to sync the content. You can learn more about this in "Notifying your users with FCM". a notification that a TV show is about to start. When the alarm is triggered, you have very few seconds to finish the work and your app may not have access to the network (for example during Doze or due to App Standby buckets). If you really need network or to do a long task, use WorkManager. 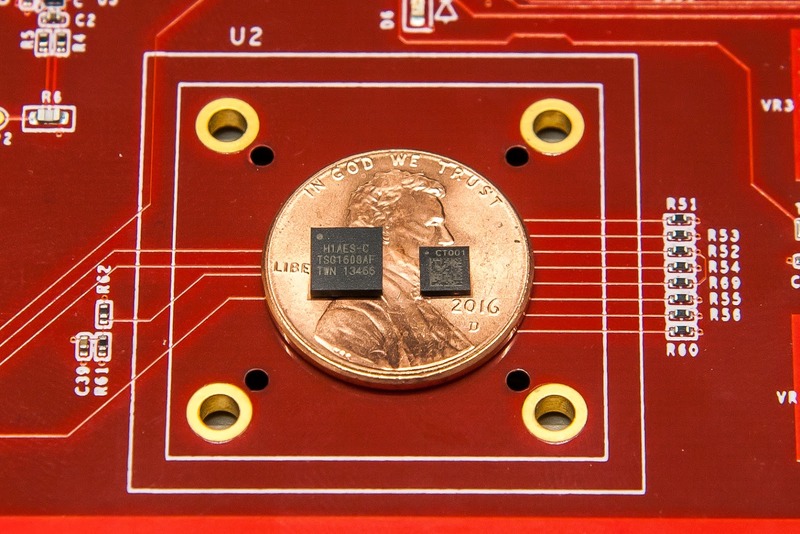 Every time a wakeup alarm is triggered, the device comes out of low-power mode and holds a partial wake lock which can significantly impact the battery life over time. This can be monitored via excessive wakeups stats highlighted on Android Vitals, provided via Google Play Console. Trigger actions that involve user interactions, like notifications at an exact time. Use background execution judiciously so that you can build cool apps that delight users while saving their battery. 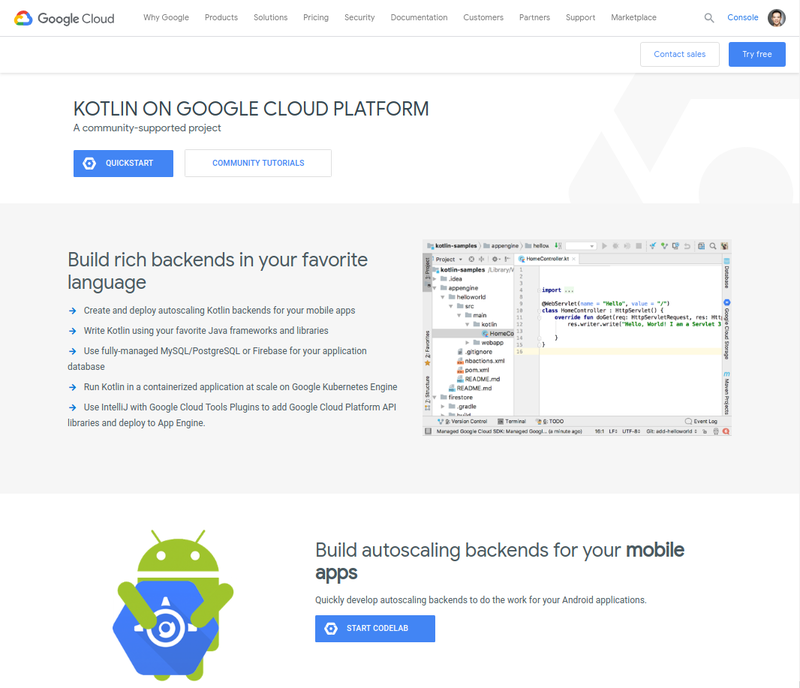 If you need more information on executing background tasks on Android, there's great content at the Android developer site.